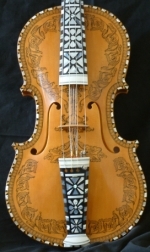 Completed in 2003 this violin built to the Sandvik pattern, and decorated with rosing and inlay from a Gunnar Rostad pattern of 1912. The instrument is strung with a total of 9 strings, 4 'melody' strings and 5 sympathetics. 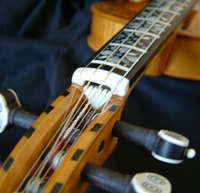 Traditional tuning of the hardanger fiddle requires the bottom G string to be tuned up a tone to A, giving (ascending) A-D-A-E. The sympathetic strings are tuned as B-D-E-F(sharp)-A. The rosing is from a Gunnar Rostad pattern of 1912, and is hand-drawn using drafting pens, and is applied to the front, back pegbox and the ribs. The pegs are finished with traditional bone facing and decoration. The crown is gilded (with gold leaf), and the teeth are more pieces of bone. The 5 sympathetic strings run through a channel made between the neck and the fingerboard. The fingerboard and tailpiece are to the same Gunnar Rostad pattern as the rosing, and are made up of between 180 and 300+ separate pieces of bone, mother of pearl and abalone.